Platform beds are very popular nowadays as they give a neat and clean look to your bedroom and can be accommodate in any size bedroom. Read on to know about platform bed styles and designs available in the market and get one for your bedroom. 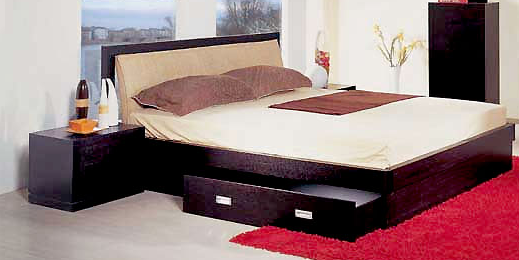 Platform beds are the modern style beds which give a neat and clutter free look to any size bedroom. These style beds are typically made from wood or metal and are designed to support a single mattress. Platform beds are available in many designs and sizes with or without storage option you can choose any of them according to your choice and budget. Asian style platform beds are inspired by Japan, China and Thailand as they have clean Zen-like lines and hand-carved designs into the bed frame which provide a uncluttered, classic and elegant appearance to any bedroom to create peaceful and relaxing space. Asian style platform beds are made from oak and other hardwoods. Contemporary platform beds are inspired from traditional European designs and have with simple yet bold lines. Contemporary platform beds are also known as modern platform beds typically made with mahogany or oak wood. These platform beds have very short legs for a sleek look. Sleigh platform beds are designed with large footrests and headboards for extra comfort and safety. These are ideal for kids and guest's bedroom as Sleigh platform beds may also be designed with storage drawers or shelves underneath. Storage platform beds has a set of shelves or drawers under the mattress where you can keep clothes, shoes and other personal necessities. These beds can be designed in Asian, contemporary or any other style you like. As these beds have extra storage space so these are raised higher than traditional platform beds to accommodate extra storage space. Eco-friendly platform beds are made up of bamboo wood which are very durable and environmentally friendly also. 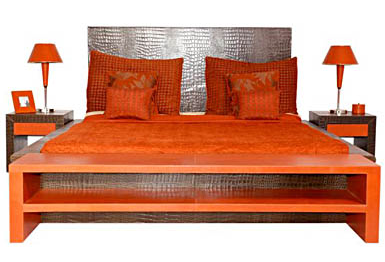 Bamboo platform beds are great to create eco-friendly bedrooms. You can choose any of the above mentioned platform bed style according to your room size and interiors to enhance the look and comfort in your bedroom.